Wild Bread Chatroom - Kamut "wild sourdough mother"
Using 100% Organic whole wheat Kamut flour from Montana Flour and Grains, to start my Kamut mother, using the same ratio of 3/8's flour to 1/4 cup water, I find it's much different from the other wild mother. The White Baron white wild mother is more of the consistency of heavy pancake batter, whereas the Kamut is more like rising bread dough. Is this the way it's suppose to behave or am I doing something wrong? (My Kamut rises between feedings with a few bubbles whereas the Organic Baron White flour mother is thinner with lots of bubbles.) I've made bread loaves with the Kamut mother, and it rises fine etc. Just wondered about the heavier consistency. The Kamut mother will be thicker than the white flour mother. In the beginning, when you mix the Kamut flour and water together, it's thick and paste-like. I always find that with all the flours, the mother is a little stiff for the first 3 days or so, and then it loosens as it begins to ferment. Even after the Kamut mother is established, it will be a thicker consistency. The same is also true for white rice. With these thicker mothers, I've found that adding more water results in the mixture separating more between feedings. Is it thick to the point that it's difficult to stir? Even though it's a thicker consistency, it should be easy to stir the flour and water in. Kamut is always my favorite to stir because the flour mixes in so well that I don't need to worry about rogue clumps of flour. Thank you Ashley. The mother stirs easily enough, just thicker consistency and at feeding time it's almost fluffy with the rise. I may increase the water just a tad, but I think from what you said, things will be fine. Just thicker mother. I've never worked with Kamut before so it's a new learning experience. Hi All, This was my third bake day and I am just now trying the first loaves. After week 1 my Kamut mother smelled slightly tangy but had only a rare bubble and was quite thick, not like the photo in the book. It has been cold here, my house has been 65 degrees so I�ve been trying all kinds of things to place my bowl in a warmer place. I thought I could avoid the pricey proofer! Pancakes were a bit dense. Week 2 and the waffles were delicious! 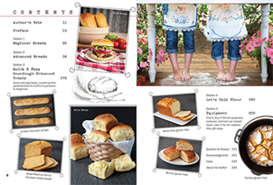 Gave in and ordered the proofer but it�s backordered everywhere maybe because it seems to be on sale? Today, still not a lot of bubbles but quite the tangy smell. My dishes of dough are at 6 hours and no discernible rising at all, even though it�s a warm day. The house is about 80 degrees. 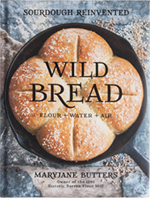 I�m a total novice at bread making. I tried making the starter in your older book in the past but it got moldy on day 5 so I had to toss it. Your new book is awesome! I�m keeping on! Hi Joan, it sounds like you're doing a lot of good trouble shooting, hang in there! It's a bummer that the proofers are backordered, but also nice that they're on sale! Because it's a whole-grain, Kamut makes breads that are naturally more dense than say, white flour, but that doesn't mean that you should end up with dense door stops. Temperature seems a likely culprit, and sometimes (especially during season transitions when temperatures are prone to fluctuations), your mother can take a little longer to get established. The smell you are describing is encouraging, and tells me that something is happening! My advice at this stage is to do what you're doing--keep keeping on and watch it continue to grow! I baked my perceptibly �unleavened� dough anyway and in a word, it is AWFUL. That tangy flavor is almost like vinegar, the texture is dense, but there are air bubbles, the largest being about 1/4�. My thermometer read 203 degrees but the mouth feel is gummy. Ack! Do you think I have to start over? I�m most concerned about the flavor. That's too bad that your first loaves weren't good. I will say that the batter loaves do make a moist loaf, but gummy wouldn't be a word I would use to describe them. I wouldn't start over. Hopefully the 1/2 cup of mother that you reserved to begin feeding as your new mother will continue to grow and become more yeasty. It sounds like fermentation is definitely happening, but at this point you don't really have much yeast activity. The vinegar taste you described isn't exactly a flavor I would attribute to sourdough, based on that description, it seems to me you might have some overactive lacto bacteria in there. These critters convert sugars (starch) into acid. They are naturally present in sourdough mothers, but too many, and your have an overly sour mother. To help balance out your mother, I think spending 1-2 minutes stirring your mother at each feeding will help. This will invite more oxygen into her, which should bring in more wild yeast with it. Are you using organic Kamut flour? I rec�d my long Backordered proofer today. I�m thinking of tossing my Kamut as it seems to consistently make wonderful �doorstops� (!) as you say. And I wonder if it is beyond repair. I�ve gone thru 10# of grain trying to make this work. If a mother has gone kaput can it be revived or best to start over fresh? It still makes the best waffles. Any input? I would love to post a picture but can�t seem to find that icon. Donna, if you use the "Quick Reply" box for responses, there is a little yellow and gray icon with a mountain and sun directly above the text box on the left. If you click the "Reply to Topic" link at the top right of each thread to reply, your photo insert options will be on the top right. The image is the same yellow and gray icon with a mountain and sun. Here, you have two options, the manually insert a photo and to upload.